Australian Bauxite Ltd (ASX:ABX) provides the Chairman's Address to AGM 2018. Welcome to the 9th Annual General Meeting of shareholders of Australian Bauxite Limited ("ABx"). ABx has supplied to date 78 thousand tonnes of cement-grade bauxite and six thousand tonnes of fertiliser grade bauxite to our repeat customers. ABx remains ready to sell metallurgical grade bauxite when prices improve slightly and/or the Australian dollar exchange rate falls. ABx's range of bauxite products can be sold into Asia, India, Middle East, North America and Australasia, specialising in the low-alkali high late strength cement-grade bauxite market, the trihydrate metallurgical bauxite market, fertilisers and eventually the high-priced refractory-abrasive grade bauxite markets, especially from its recently discovered deposit at Penrose 90kms inland of Port Kembla NSW. b. ALCORE chemical refining of bauxite to produce aluminium fluoride from bauxite as well as co-production of silica fume, Corethane hydrocarbon and other products. Last year, ABx reported that prices for metallurgical bauxite for the aluminium industry had been weak for about 18 months. Bauxite prices stabilised and have strengthened slightly in US dollar terms since the 3rd quarter 2017 and currently are sitting around the break-even price for ABx's type of bauxite. The buyers of bauxite for the aluminium industry are aware of this and ABx's marketing team are pressing for increased pricing or we will have to await a weakening of the exchange rate in our favour. The market is in flux at this time. Bauxite prices in our other markets, especially cement-grade are solid as infrastructure construction expands and cement manufacturers are seeking ways to increase production tonnages from existing cement plants. ABx has now proven that its bauxite is ideal for maximising the production of low alkali, high late strength cement for infrastructure construction, which is growing strongly and more recession-proof than aluminium. Once a customer converts to ABx's product, repeat sales are likely and ABx was pleased to make another major sale to a repeat customer in late 2017. ABx has sold 84 thousand tonnes of bauxite to date in 7 sales of cement bauxite and 8 small, regular sales of fertiliser grade bauxite. ABx has a further 93 thousand tonnes of product stockpiled at Bald Hill and also has sufficient broken ore stocks for next year's sales target. ABx completed a successful large-scale bulk test of TasTech at the Fingal Rail project in Tasmania, processing 900 tonnes of ore from the Fingal Rail deposit and 100 tonnes of ores from our Bald Hill mine stockpiles in mid 2017. This bulk test confirmed TasTech technology to be a robust, low-cost process that will become the core of ABx's bauxite operations. 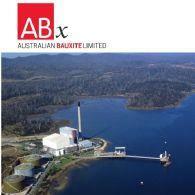 During the research and development of TasTech technology, ABx encountered a new technology named ALCORE that can produce high-value products from ABx's ultra-clean type of bauxite, including Aluminium Fluoride (AlF3) that is in strong demand from aluminium smelters and for Lithium ion batteries. ALCORE can also produce a pure refined hydrocarbon called Corethane which can be used for electricity generation as a substitute for gas in gas turbine generators; can be an inexpensive substitute for diesel to provide fuel security; and can be sold for many industrial uses. The Board of Directors have decided to create a subsidiary called ALCORE Limited to fast-track the development of the ALCORE porject, starting with Stage 1 which will focus on the production of test samples for both potential customers and the prospective providers of loans to build the first production plant. The costs for Stage 1 have reduced substantially since December 2017 to about A$3.3 million and such cost reductions may also apply to the full-scale refinery construction and operations. The Board decided to accelerate ALCORE's development so that the ALCORE production plant can commence its sales at about the time that construction is completed of many new aluminium smelters which will be ALCORE's main customers. This way, ALCORE can secure its market share more rapidly during a time of strongly growing demand and thereby deliver returns to shareholders faster. A capital raising is well advanced for ALCORE Stage 1 and a detailed presentation was released to the ASX yesterday, Monday 28 May 2018. Response has been very good. I will ask the CEO to present this following this meeting. Twelve months ago, ABx commenced discussions with the Queensland Government and with its marketing partner, Rawmin Mining and Industries of India to assess if it was worth conducting feasibility studies for the commencement of a large bauxite project at Binjour in central QLD, 115kms inland from Bundaberg. In December 2017 and during the first Quarter of 2018, ABx conducted a bulk sampling of 2,000 tonnes of bauxite from Binjour and developed representative bulk samples for prospective customers, with an independent expert's report on the results. Investigations to date show that there are challenges regarding the logistics of this project, mainly relating to road haulage limitations and work needed at the Port of Bundaberg to allow the use of high volume shipping. Nevertheless, Binjour is starting to attract serious interest, especially from alumina refineries in India that are short on bauxite supply whilst they are expanding their refineries. Our marketing partner, Rawmin will be instrumental in securing the customers that will be essential for an early development of Binjour. Announcements about progress on the Binjour Project are expected in the near future. In February 2017, ABx discovered a high-grade, low-iron grey-white bauxite at Penrose Pine Plantation some 90kms inland from Port Kembla. Extensions of the deposit have been secured by a new exploration lease and experiments completed to confirm that this deposit has potential to be highly profitable, even at modest tonnage rates, by supplying cement-grade bauxite and high-priced refractory-grade bauxite. ABx has formed a working alliance with a trading company that sells refractory grade bauxite and is also in discussions with industries that use such bauxite for manufacturing industrial chemicals, including chemical products used for water purification. ABx has made the transition from explorer to producer with a zero-incident record and no breaches of the industry-standard safety procedures that had been established at the mine from the outset. ABx preserves the soil from at the Bald Hill Bauxite Project ready for reinstatement after mining and also eradicates weed infestations in accordance with ABx's policy of best practice on agricultural land. Pit areas that have been mined-out have now been reinstated and successfully returned to sheep grazing and cropping ahead of schedule. This expertise will become a core skill and part of the ongoing research and development for the company. We are thankful for the support of our local communities. We have honoured our policy to only operate where we are welcomed and the growing community acceptance is heartening. We will overcome the market challenges. Sales negotiations are critical and our marketing team are pushing hard to secure successful outcomes from current negotiations. We will achieve a dedicated market for our bauxite by developing ALCORE and this will generate a growing income stream for ABx shareholders. We believe we are unlocking value for all shareholders by fast-tracking the development of ALCORE. On behalf of the Board of Directors, I thank the ABx staff and supportive shareholders for the hard-won progress and development achieved in 2017 which provides a platform for success in 2018-19.